Not the Half New Order Vatican II "New Latin"
"Some Things in Life Should Never Change"
ST. JOHN'S ORATORY IS THE ONLY LOCATION IN THE BAY AREA THAT HAS PRESERVED THE REAL, VALID, FULLY TRADITIONAL CATHOLIC LATIN MASS (1950) AND RITES BEFORE THEY WERE CHANGED INTO A HALF NEW ORDER "NEW LATIN" (AKA "EXTRAORDINARY") SERVICE IN 1962 AND BEFORE, INTO AN INVALID NEW ORDER SERVICE IN 1969. Even the 1962 "New Latin" service is NOT the TRADITIONAL CATHOLIC Latin Mass, even though it may be falsely advertised as such to trick the ignorant into its Protestantized service by throwing in some Latin. We here at St. John's Oratory since 1992 have never deviated from the true and valid Traditional Latin Mass, True Sacraments, and True Faith of 2,000 years. St. John's Oratory did not come only recently to this Apostolate, but has offered, with experience, knowledge, and commitment, the Traditional Latin Mass and Divine Office every Sunday and Holyday since 1992. St. John's Oratory is also known as a center for promoting the traditional Latin Gregorian chant of the traditional Roman rite. Gregorian chant is sung every Sunday and Holyday by the St. John Gregorian Schola of San Francisco. For general information about the times and nature of the Society's services, click on SERVICES AT THE ORATORY. All services are offered only on site. This is not a wedding chapel. We do not conduct extra-congregational weddings or funerals. For the Society's current schedule of fully Traditional Latin Masses and other traditional services, click on CURRENT MASS SCHEDULE BULLETIN. For general information about traditional Roman Catholicism, click TRADITIONAL ROMAN CATHOLICISM. If you wish to receive our weekly E-mail bulletin containing information on Oratory schedules and activities, please send your name, mailing address, and E-mail address to the SOCIETY. If you have any questions, you may send them to the SOCIETY as well. We draw your attention to our schedule of services for Holy Week & Easter. St. John's Oratory is the only location in the San Francisco Bay Area where the fully Traditional Latin Solemn Rites of Holy Week will be available to the faithful, with chant by our St. John Schola. These are holydays that no true Catholic will miss. For the full schedule, click on Current Mass Schedule Bulletin. On Monday, Tuesday, and Wednesday of Holy Week, Catholics traditionally complete the daily chores that might be an obstacle to participating in the Maundy Thursday, Good Friday, and Holy Saturday rites. All true Catholics should make even heroic efforts to be present at these solemn rites of Holy Week, in their traditional Catholic Latin form, the ancient form that existed before 1956. On Maundy Thursday we commemorate the institution of the Holy Eucharist, the First Mass, and the Ordination of the Apostles. The priesthood and the Holy Eucharist are living events that should remind us of the continuing value of Christ's act of redemption for the sin of man. Good Friday is an unforgettable reminder to all of us of the price of being a follower of Christ. We have to give something of ourselves to be followers of Christ. The Holy Saturday Vigil is the most solemn memorial of the central mystery of our redemption: Christ's saving death and glorious resurrection. We are reminded that we are obligated as Catholics to carry Christ into our world. Relying upon your continuing generosity, we do not send out numerous fund-raising communications throughout the year, but only one at Advent/Christmas and one at Holy Week/Easter. We ask you, therefore, before secular Easter preparations intrude upon your spiritual Holy Week preparation, to consider sending a tax-deductible donation to support the Oratory's work as the only site in the San Francisco Bay Area making available the fully Traditional (pre-Vatican II, 1950) Latin Mass, Sacraments, and Sacred Chant, including the fully-traditional rites of Holy Week. See the "Donations to the Society" section on this page. Contributors become Benefactors of the Oratory and share in the fruits of all the Divine Offices and Holy Masses that we offer here. An additional altar server is needed to serve the Traditional Catholic Latin Mass. No experience or knowledge of Latin is necessary. We will teach you what you need to know. If you would like to serve at the altar or have any questions, you may address the Society. 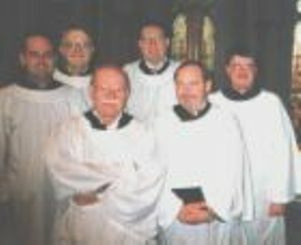 Additional men are invited to add their voices to the St. John Schola Cantorum (small choir) to sing Gregorian plainchant in an authentic setting. No previous knowledge of the chant or musical notation is required; most of our participants have had little or no music background. We can teach you all that you need to know by ear if you have just a basic ability to sing. No auditions. You do not have to be Catholic. We are a small, friendly group, no pressure, just enjoyment, but we are led by a highly-experienced praecentor (leader). 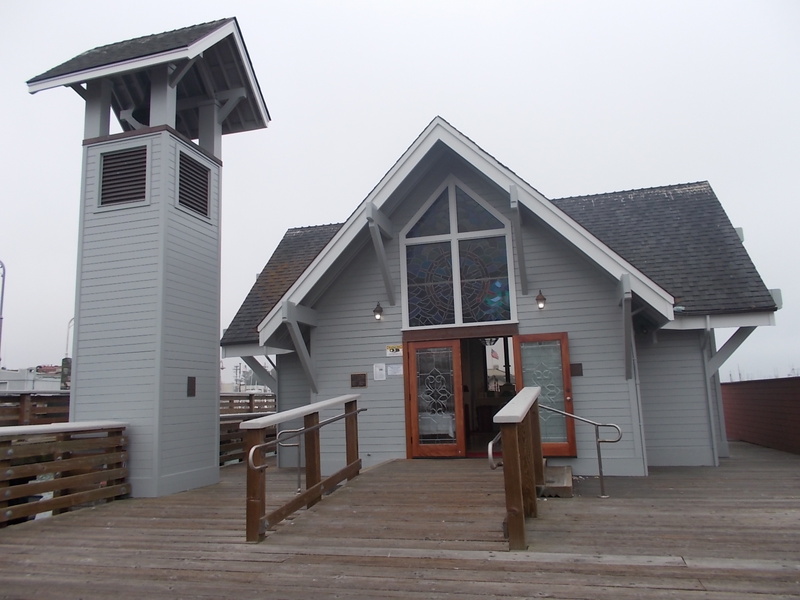 For sixteen years our group has been chanting in the intimate setting of St. John's Oratory at the historic Fishermen's & Seamen's Memorial Chapel at Fishermen's Wharf in San Francisco. We practice 9:00-9:30 a.m. Sundays and then chant the traditional Catholic Hour of Terce 9:30-10:00 a.m and chant monthly for the only fully traditional Missae Cantatae (Sung Masses) in the Bay Area. We are currently producing live recordings of our chant for the ChantCD label. You will receive a free copy for family and friends of any CD in which you participate. We make no pretense to being anything but amateurs (lovers of the chant) and to demonstrating merely what is achievable over time by an amateur small chant choir. For further information about the St. John Schola for Gregorian Chant, click on St. John Schola for Gregorian Chant. If you have any questions, you may address them to the Society. Our traditional Catholic schola answers the peal of the call to prayer from the bell-tower to chant the Hour of Terce, followed by the chanting of the Angelus to the traditional eighteen strikes of the bells. Then follows the Asperges, or lustral sprinkling of the congregation with Holy Water, which takes place before the principal Mass on Sundays. After the Asperges, the Sung Mass begins. The Hour of Terce of the Divine Office is the third Hour of the day, the one traditionally appointed to be chanted immediately before Holy Mass. 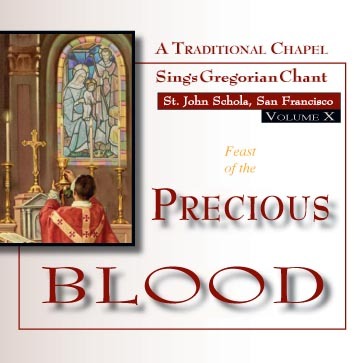 The majority of this recording covers the Mass for the Feast of the Most Precious Blood of Our Lord Jesus Christ. This feast, assigned to July 1, celebrates the redemptive power of the Blood of Christ shed upon the Cross for mankind. The Ordinary chants here are taken entirely from Mass VIII De Angelis of the Kyriale, supplemented by three traditional motets: one Gregorian, one by the sublime polyphonist Palestrina, and one by St. Thomas Aquinas. The ancient French melody Christus Vincit constitutes the recessional. The recording is 57 minutes long. The beauty of the devotional images on the cover artwork of these CDs, designed by a leading traditional Catholic graphic artist, is stunning and makes owning the CDs a treasure for the cover images alone. Our St. John Schola is recording this CD series entitled A Traditional Chapel Sings Gregorian Chant. For descriptive and ordering information on our CD series and to hear excerpts of our Gregorian chant, click on St. John Schola for Gregorian Chant. If you wish to support the work of the Society, click on the box above to make a donation easily, securely, and confidentially by bank account or credit card through PayPal (note in the PayPal message field: "Donation to SSJA"). By doing so, you will be part of the habitual intentions of Benefactors specially commemorated at Traditional Latin Masses. Using PayPal reduces our administrative burden considerably, but if you need to use a paper check, E-mail the Society for a mailing address. Copyright © 1991-2018. Publication of any material from this site without explicit written permission is strictly prohibited. 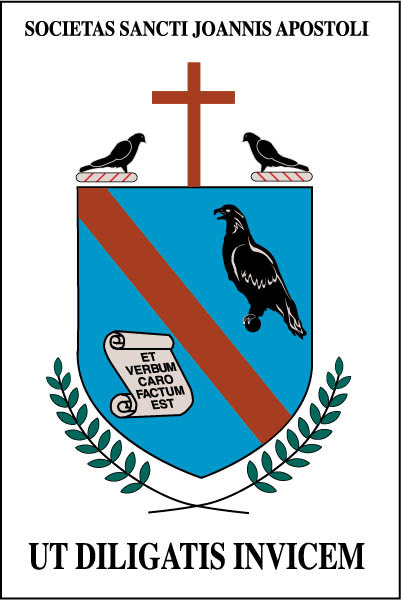 The Society of St. John the Apostle operates independently of any diocese or other religious society. The information and materials contained in this web site are provided "as is" without warranty of any kind, either express or implied, including without limitation any warranty of accuracy, adequacy, or completeness of the information and materials, title, non-infringement, merchantability, fitness for a particular purpose and freedom from computer viruses.